1.8" USB 2.0 Aluminum Hard Drive Enclosure for Toshiba 1.8" Drives. Hard to find enclosure to fit Toshiba 1.8" hard drives with female pins. Q: Does that enclosure also work with regular USB 1.1 port?. 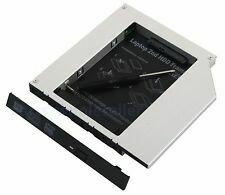 Extra Mounting Screws allow to install 2.5" IDE & SATA HDD/SSD to 3.5" Bay easily. If you are have trouble to install 2.5" Drive in your computer case, ORICO Full Aluminum 3.5" Mounting Kit with Anodizing Surface & Unparalleled Form will be an ideal solution for you. DELL P/N 0X1507. Dell Inspiron 9100. New Dell Genuine IDE connector Dell P/N 8267R. Hard drive is not included. Compatible system. New Page 1. Dell Inspiron Hard Drive Caddy. 1 caddy, 1 connector and 4 screws. Inspiron: 1100, 1150, 5100, 5150, 5160. What you get. Trending at $5.67eBay determines this price through a machine learned model of the product's sale prices within the last 90 days. · The 2nd Hard Disk Drive Optical bay Caddy / Adapter to bring you new maximum data storage flexibility. With the second HDD/SSD in your Laptop to swap optical drive, You can speed to backup important applications and critical data ( Simply remove your CD-ROM drive and put the Caddy (with the added hard drive) in its place;. ). DELL P/N 048cvx, 48CVX. Dell Latitude C800, C810, C820, C840. Dell Latitude V700. Dell Latitude inspiron HDD caddy/Tray New Dell Genuine With New Genuine connector. New IDE connector Dell P/N 8267R. IDE 44 Pin. 1 x Hard Drive Connector. This is our SOP, for us to be certain and for record purposes. Trending at $2.82eBay determines this price through a machine learned model of the product's sale prices within the last 90 days. Dell C series Optical Drive Channel Extender 2935D. Compatible with Dell C series CD/DVD/CDRW internal drives. Included: Connector only. 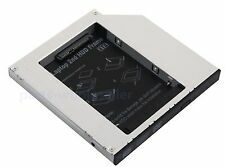 12.5mm IDE 2.5" PATA USB 2.0 Portable Hard Drive Enclosure Case. Install your 12.5mm IDE hard drive into this case and use your drive as an external portable hard drive! 12.5mm IDE Enclosure Case. OHCI based 12Mpbs USB 1.0 compliant. 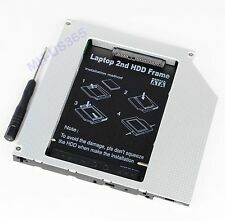 12.7mm PATA / IDE to SATA 2nd Hard Drive Caddy Adapter to Replace Laptop 12.7mm IDE Optical Drive CD / DVD-ROM. The 2nd Hard Disk Drive Caddy / Adapter to bring you new maximum data storage flexibility. DELL P/N 0HC428, HC428. Dell Inspiron 630M. Dell INSPIRON /Latitude Hard Drive Caddy. New Dell Genuine IDE connector Dell P/N 8267R. Hard drive is not included. Compatible system. New Page 1. 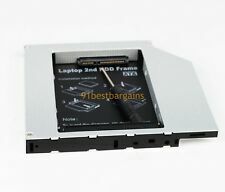 High quality hard drive caddy for your Dell laptop. Interface: IDE. 1 x bottom tray cover. VERY CLEAN HDD TRAY. 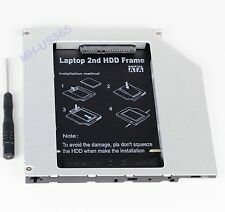 include 4 Screw for each Tray, can be use for install HDD. USED GOOD Condition, LOT OF 2. Interface for motherboard: PATA / IDE. · The 2nd Hard Disk Drive Optical bay Caddy / Adapter to bring you new maximum data storage flexibility. With the second HDD/SSD in your Laptop to swap optical drive, You can speed to backup important applications and critical data ( Simply remove your CD-ROM drive and put the Caddy (with the added hard drive) in its place;. ). Dell Inspiron 7000/7500 Hard Drive Caddy's Connector (adapter) only. -------------------------------------------------------------------------------- Dell Inspiron 7000/7500. -Hard drive, and caddy are not included. 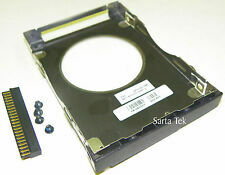 Dell Latitude D610 Hard drive caddy. Dell Latitude D610 sERIES. New IDE connector Dell P/N 8267R. DELL P/N 0D5410/D5410. Compatible system. Hard drive is not included. Compaq Presario 2100, 2500 Series. This IDE Hard Drive Connector will work for HP, DELL, Toshiba. HP Omnibook 500, 510, 6000, xe4400, xe4500. HP ZE4100 to ZE5749CL. Hard Drive not Included. DELL P/N 0K1664/ K1664. 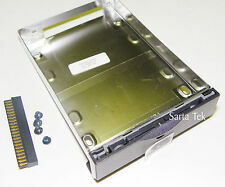 Dell Latitude D505 Hard drive caddy. Latitude D505 Series. New IDE connector Dell P/N 8267R. Hard drive is not included. Compatible system. New Page 1. · Dell Inspiron 2600 2650 1100 1150 5100 5160;. · The 2nd Hard Disk Drive Optical bay Caddy / Adapter to bring you new maximum data storage flexibility. With the second HDD/SSD in your Laptop to swap optical drive, You can speed to backup important applications and critical data ( Simply remove your CD-ROM drive and put the Caddy (with the added hard drive) in its place;. ). HP NX6110, NX6120, NX6130, NX8220. HP NC6140, NC8230, NC6120, NC6220, NC623. Dell Inspiron 200M Latitude 200 Hard Drive caddy. Dell Inspiron 200M. Complete caddy Kit Dell. Dell Latitude 200. -Tray Used/System pull. -Hard drive is not included. -Compatible system. Dell P/N F0858. Dell Latitude X200. Dell Inspiron 200M. Dell Latitude X300. Dell Inspiron 300M. 10 Dell HHD Connectors/ Adapters. Connector only. Part number BA41-00368A. Compaq Presario M2500 Series. HP Pavilion dv1700 Series. Pavilion: ZE2000, ZE2100, ZE2200, ZE2300, ZE2400, ZE2500. HP Pavilion dv1600 Series. HP Pavilion dv1500 Series. Compaq Presario M2400 Series. HP Pavilion dv1000 Series. DELL P/N 0G5044,G5044, 0KJ698, KJ698. New IDE connector Dell P/N 8267R. Inspiron 6000 9200 9300. Compatible system. Hard drive is not included. Compaq Presario V2200 Series. HP Pavilion dv1100 Series. HP Pavilion dv1200 Series. Compaq Presario V2100 Series. HP Pavilion dv1400 Series. HP Pavilion dv1300 Series. HP Pavilion dv1000 Series. HP Pavilion dv1500 Series. HP Pavilion ze4100 ze4200 ze4300 ze4400 ze4500 ze4600 ze4700 ze4900 series. HP Compaq Presario 1100 2100 2200 2500. Hard drive is not included. Compatible system. Omnibook: XE4100, XE4500. HP Compaq Presario 1100 2100 2200 2500. HP Pavilion ze4100 ze4200 ze4300 ze4400 ze4500 ze4600 ze4700 ze4900 series. Hard drive is not included. Compatible system. · HP Pavilion zd7000 zd7100 zd7200 NX9500;. · The 2nd Hard Disk Drive Optical bay Caddy / Adapter to bring you new maximum data storage flexibility. With the second HDD/SSD in your Laptop to swap optical drive, You can speed to backup important applications and critical data ( Simply remove your CD-ROM drive and put the Caddy (with the added hard drive) in its place;. ).